There is a Korean proverb that’s literally translated as “To blow the nabal thanks to a local magistrate.” In the old days, when a new government official is appointed as a local magistrate and makes an entrance into the village, he is usually followed by a band playing music. In order to make it easier for the musicians to perform during the procession, the band is usually comprised of wind and percussion instruments. The band is called “chwitadae.” The Chinese character “chwi” means “to blow” and refers to a wind instrument, while “ta” means “to beat” and indicates percussion instruments. The wind instruments include the “nagak” made from a conch shell and the “nabal” that resembles the shape of a long funnel. The uniform of the chwitadae band is very flamboyant as the members are entirely donned in yellow attire matching their hat adorned with a feather. They certainly stand out in the crowd. So, the aforementioned local saying means that one can blow the nabal and show off in front of the public thanks to the local magistrate’s procession. But since the nabal and nagak can produce only a single note, the melody could become a bit monotonous. And that’s when the taepyeongso is added to play the melody. Since we will be learning about the taepyeongso today, let’s first listen to a piece played by the chwitadae. The traditional piece called “Daechwita” is played when the king takes a ceremonial walk outside the palace or during a military march. 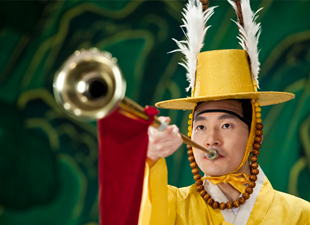 The sole musical instrument that plays the melody is the taepyeongso. Most of the traditional wind instruments in Korea are made of bamboo. But the 30 cm-long gwandae, the soundbox of taepyeongso, is made from hard wood such as a jujube tree. The front part is fixed with the copper “dongpallang” that looks like a funnel. Meanwhile the mouthpiece called “seo”, or the double reed, where the performer blows his breath into is made of reed. The special feature of taepyeongso is that it makes a metallic sound which is totally different from the sound produced by musical instruments made from bamboo. Because of its loud and sonorous, yet, light sound it’s usually played outdoors when leading a group of people. It is not only played during a military march but is also utilized to work up the pungmul band whenever they played during special holidays or farming season in a village. Traveling entertaining troupes that toured around the country also used the taepyeongso to call people together. This time, let’s listen to a piece called “Taepyeongso and Samul” that is an arrangement of a tune played by a Korean folk music troupe. The melody will make your shoulders bob up and down with excitement and make you want to run out to a vast field. The taepyeongso was first introduced to Goyreo Kingdom from China about 1,000 years ago. It is said that the wind instrument originated in Central Asia where a musical instrument called “surnay,” or “zurna,” was played. As surnay came into China it was also called by new monikers such as “surla” or “sornai.” In Korea, it was also called “saenap.” Since it’s a wind instrument from China, it’s also referred to as “hojeok” while it’s also called “nallari” due to its unique sound. The sound of taepyeongso is very delightful but, at the same time, sad when heard from a distance. But due to the limited range of notes that can be played on it, taepyeongso pieces are restricted to a few. So, in the 1970s, the retooled musical instrument called the jangsaenap was developed in North Korea. As the name indicates, it’s longer than saenap and has more holes to extend the range of notes that can be played. The holes are not covered by the fingers but it’s played by using a special feature called “nurugae” to play various musical pieces. Since Korea is divided into South Korea and North Korea, each country developed traditional music its own way. In Japan, there is a group of musicians called the “Geumgangsan Opera Troupe” that follows the North Korean version. Its performance was introduced to Seoul recently and is also arresting the public’s attention. Let’s listen to a jangsaenap piece played by the troupe in Japan. The taepyeongso is an outdoor musical instrument played while marching the street. 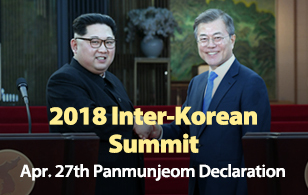 Let’s hope the valiant sound of the wind instrument makes way for two Koreas to come to a mutual understanding. Next time, we’ll learn about the “saenghwang” which renders a unique sound that is often compared to the cry of a phoenix or a dragon.